Chocolate Mousse | Easy Recipe for an Amazing Chocolate Dessert! Chocolate Mousse | Easy Recipe for an Amazing Chocolate Dessert! 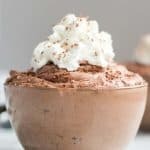 Thick and creamy homemade chocolate mousse made with just a few 4 simple ingredients, whipped into a perfectly fluffy chocolate dessert. In a double boiler, melt chocolate chips with 2/3 cup of the cream and the corn syrup. Once melted and smooth, stir in vanilla and flavored extract, if using. Stir in remaining 1 1/3 cup cream and stir to combine. Place in a glass or metal bowl and cover with plastic wrap. Refrigerate until completely chilled. When chilled, beat with electric mixer until whipped and light, about 3 minutes. Place in serving dishes or ramekins and serve cold. Garnish with additional whipped cream and/or chocolate shavings if desired. The sweetness in this recipe comes from the chocolate. If you want a semi-sweet or dark chocolate mousse, use semi-sweet chocolate chips. If you like a sweeter mousse, use milk chocolate chips. Use a hand mixer or a stand mixer to mix the mousse after it chills. You’ll get a much lighter mousse than trying to mix it by hand. The corn syrup is added to make the texture smooth. It can be omitted if you don’t want to use it.